‘Let them eat cake!' As long as it’s Tahcheen, I’ll have seconds! This year, Anja traveled all the way from Switzerland to Los Angeles so that we can celebrate our birthdays. I thought it was appropriate for us to make Tahcheen together in the spirit of our savorychicks celebration - an elegant dish that looks and is baked like a cake, but it is actually served as a savory main course. Tahcheen is a classic Persian rice cake dish immersed in saffron, eggs and yogurt. Embedded within the rice is a surprise of either chicken or lamb (yet there are variations of recipes using eggplants and spinach). 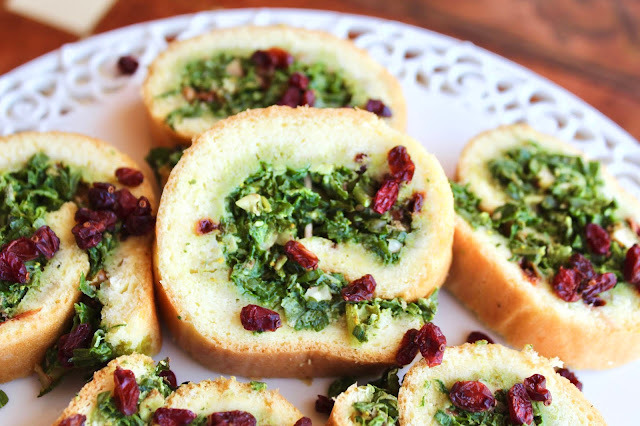 A delight to the eyes, this golden dish is baked like a cake and is served to tantalize a savory palate. 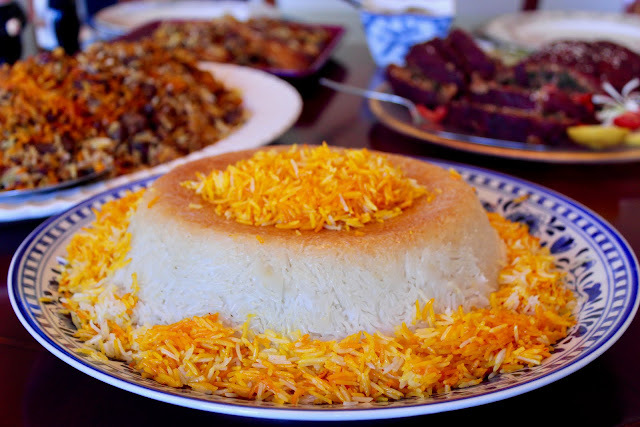 Traditionally Tahcheen is made with lamb and the best part is the outer crust of the cake which is golden crispy and full of flavor. 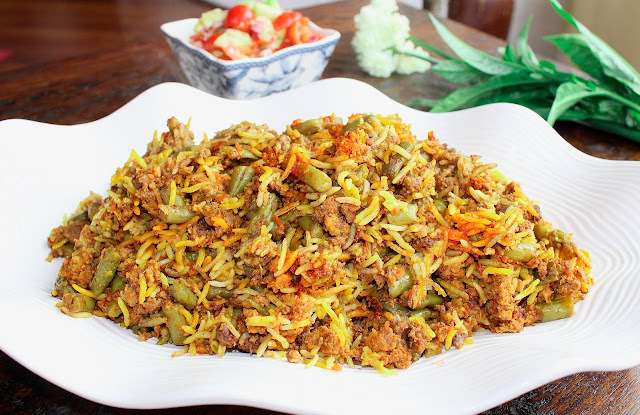 The rice inside is moist, creamy and filled with chunks of lamb to satisfy your hunger. But one piece is never enough; one must have seconds! My mother always prepares this dish on special occasions. 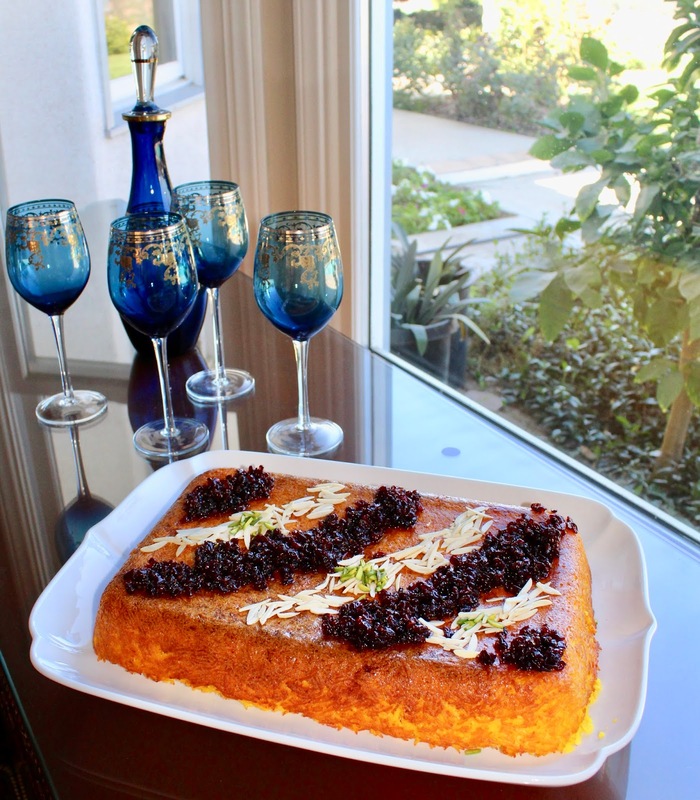 It is one of my favorite Persian dishes and of course, I can devour most of the cake all by myself. I love it when she garnishes the top of Tahcheen with Zereshk (barberries). So every time I have Tahcheen, it is like a little party inside my mouth! Minimal ingredients and royally pleasing to all senses, this cake is worth every bite! Happy Birthday to us! 1. The night before, clean and cut lamb into bite size pieces. 2. In a large bowl, beat 1 egg yolk, 1/2 tablespoon rosewater, 1 teaspoon salt, pepper to taste, 1/4 of the saffron dissolved in water, and 1 cup of yogurt. Add lamb to bowl, cover, and refrigerate for at least eight hours. 3. Rinse rice in a large bowl with cold water multiple times until the water in your bowl is less cloudy. 4. In a large pot, bring to boil 10 cups of water, add 1 tablespoon of salt and rice. Stir gently, occasionally, to prevent rice from sticking together. Immediately, remove from heat when the rice is “al dente” and pour into a rice appropriate strainer (small holes to prevent rice from draining out) in the sink to rinse out starch and the hot water. * Preheat oven to 350 degrees F.
5. Remove the lamb mixture from the refrigerator; discard as much of marinade from lamb. In a large pan over medium heat, add 1 tablespoon of oil and saute lamb pieces for 8-10 minutes until partially cooked. Turn heat off and set aside. 6. In a large bowl, whisk together cooled melted butter, 4 egg yolk, 2 cups yogurt, 1 tablespoon of rosewater, 1 teaspoon salt and the remaining saffron. Add the rice to this mixture and gently blend. 7. Use a non-stick, oven safe lasagna dish or any baking dish large enough to contain all the rice and lamb pieces (even muffin pans can be used to create individual cakes) and generously coat the bottom and sides with butter. If you wish, cooking oil spray works very well preventing the rice from sticking to the dish and therefore making it easy to transfer to serving platter. Place half of the rice mix in the bottom of the dish (or muffin pans) and spread evenly until leveled. Then place the entire marinated lamb pieces on top, again spreading evenly until leveled. Then place the remainder of the rice mix over the lamb. Cover with foil paper and place in the oven to cook for two hours at 350 degrees; remove foil cover and bake for another 20-30 minutes to achieve a dark golden crust on the outside. Remove from oven and allow the dish to rest for 5 minutes. 8. Using a serving platter larger than the baking dish, place it over the rice and flip upside down the rice cake into the platter in one piece. Be careful to not burn yourself during the flipping process- use extreme caution as the baking dish and contents are hot! 9. 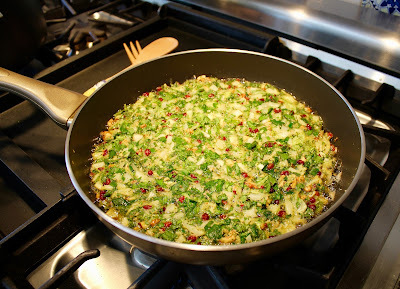 If barberries are available, saute ¼ cup of barberries in two tablespoon melted butter; add 2 tablespoon of sugar dissolved in 2 tablespoon of water; and a small pinch of saffron for 5 minutes. Remove from heat and spoon the berry mix on top of the rice cake!